1. Wash the split peas in a sieve under the cold tap for 1 minute, then put in a large pan, cover with plenty of water, add the turmeric and chillies and bring to the boil. Skim any foam from the surface and discard. Boil until tender, for about 35-40 minutes, adding more water if necessary. Drain in a sieve and set aside. 2. Wash out the pan and return to the heat. Add the butter, cumin and ginger. Cook gently for 1 minute, then add the tomatoes and garam masala. Cook for 1 minute, then add the split peas and cook for 3 minutes. 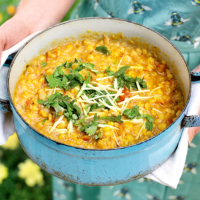 Season if necessary and add a little more water if the dhal is too thick – it should be quite soupy. Top with the ginger matchsticks and coriander to serve.